The .NET Framework created by Microsoft is a software development platform focused on rapid application development (RAD), platform independence and network transparency. .NET is Microsoft's strategic initiative for server and desktop development for the next decade. According to Microsoft, .NET includes many technologies designed to facilitate rapid development of Internet and intranet applications. Today, .Net Application Development platform plays the most imperative part in enhancing interoperability of the frameworks and supporting business to utilize the data, information and application in an effective manner. In recent times, the importance of Microsoft .NET development is perceived and saw the out of these world qualities satisfying their target audience’s demand. At PanaciaSoftwares, you will get the world-class .Net Development services to connect information, systems and services through software. 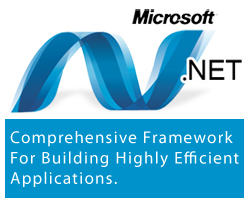 Our team provides design, development and integration business solutions based on the .NET platform. We collaborate with our customers to make a regular vision to take care of their unpredictable business situations. Our essential target is giving high caliber convention programming provisions that meet your business and technical requirements on time, under plan and with legitimate documentation. Our team of experienced .NET planners, investigators and developers delivers an extensive variety of comprehensive Dot Net Development solutions. In order to succeed in the ever evolving and dynamically changing business environment, such features as easiness of GUI navigation, flexibility in changing business rules, data mining and data transformation services (DTS) are crucial for any desktop or web application. Other important issues that need to be considered are security, role-based access of the information, backup/archiving, fail-safe and auto recovery, trail-back and application logs. For achieving these common business goals, Panacia Softwares' developers use the full range of .NET framework functionality for building sophisticated stand-alone applications as well as hosted applications. Possessing an in-depth understanding of independent software vendors and software product companies' needs, such as short development and testing lifecycles, reducing software development and support costs, enhancing product functionality for generating greater value to the customers, Panacia Softwares is committed to providing .NET software product development services based on specific clients' requirements and business goals. Our .NET based product development and engineering framework encompasses the full life-cycle starting with strategic planning and conceptualization, architecture and design, development, testing, deployment and enhancements up to porting and ongoing support of the end-to-end custom software product. The exclusive services provided to our clients by our in-house .NET developers are custom serviced ensuring a bespoke .Net application development that creates an upper hand and ease of work processes, our experts thoroughly study your business module and then programme an exclusive business process for which no packaged software available, our application also ensure that we keep your business, data, contact and other statistic and requirements up-to-date, along with the development of newer processes only when the time demands, this helps to reduce costs and also reduce your overall expenditure and time. This reduction of expenditure and time saving is caused since there is no requirement of the licence costs you have the liberty to work on modules that you need to create or may have created in accordance to your need. Therefore by choosing Panacia Softwares for .NET Application Development Solutions not only assign you a highly efficient team of trusted and skilled developers who can create the most customized application understanding your very specific need and demands but also ensure a personalised communication module throughout the process of your bespoke Application Development.